Cline, A.R., F.W. Shockley, & B. Puttler. 2002. Description of surface swimming by Hypera eximia (Coleoptera: Curculionidae): behavioral, morphological, and phylogenetic implications. Annals of the Entomological Society of America 95:637-645. Cline, A.R. & E.A. Backus. 2002. Correlations among AC electronic monitoring waveforms, body postures, and stylet penetration behaviors of Lygus hesperus (Hemiptera: Miridae). Environmental Entomology 31:538-549. Kirejtshuk, A.G. & A.R. Cline. 2003. Pleoronia tuberculata Kirejtshuk and Cline sp. n. and Stenoronia librodoriformis Kirejtshuk and Cline sp. n. In Kirejtshuk, A.G. Four new genera of the Soronia complex (Coleoptera: Nitidulidae) from Australia, New Zealand, Fiji, and tropical America with notes on composition of the complex and description of new species from Southern Hemisphere. Russian Entomological Journal 12:239-256. Cline, A.R. 2003. New distribution records for Pocadius basalis Schaeffer (Coleoptera: Nitidulidae: Nitidulinae) from the Southwestern United States. The Coleopterists Bulletin 57:390. Shockley, F.W. & A.R. Cline. 2004. A Contribution to the Inventory of Coleoptera from Missouri: Records from Benton County. Journal of the Kansas Entomological Society 77:280-284. Ewing, C.P. & A.R. Cline. 2004. New records and taxonomic updates for adventive sap beetles (Coleoptera: Nitidulidae) in Hawaii. Bishop Museum Occasional Papers, Records of the Hawaii Biological Survey, Part 2: Notes 79:40-45. Cline, A.R. & C.E. Carlton. 2004. Two new species of Epuraea (Orthopeplus) (Coleoptera: Nitidulidae) from Mexico. The Coleopterists Bulletin 58:261-270. Cline, A.R. & C.E. Carlton. 2004. Review of Lasiodactylus Perty (Coleoptera: Nitidulidae) with description of three new species from the Neotropics. The Coleopterists Bulletin 58: 355-368. Cline, A.R. 2004. New state records for two species of Thalycra Erichson (Coleoptera: Nitidulidae) with notes on species sympatry. The Coleopterists Bulletin 58:137-138. Cline, A.R. 2004. A new sap beetle (Coleoptera: Nitidulidae) to the United States with a revised key to the Camptodes Erichson occurring in America North of Mexico. Insecta Mundi 17:101-102. Cline, A.R. 2004. A new species of Psilotus Fischer vonWaldheim (Coleoptera: Nitidulidae) from Peru, with new distribution records for other Psilotus species. Proceedings of the Entomological Society of Washington 106:890-898. Ewing, C.P & A.R. Cline. 2005. Key to Adventive Sap Beetles (Coleoptera: Nitidulidae) in Hawaii, with Notes on Records and Habits. The Coleopterists Bulletin 59:167-183. Cline, A.R. & R.A.B. Leschen. 2005. Coleoptera associated with the Oyster Mushroom, Pleurotus ostreatus Fries, in North America. Southeastern Naturalist 4:409-420. Majka, C.G. & A.R. Cline. 2006. New Records of Corylophidae (Coleoptera) from the Maritime Provinces of Canada. The Coleopterists Bulletin 60:105-111. Majka, C.G. & A.R. Cline. 2006. Nitidulidae and Kateretidae (Coleoptera: Cucujoidea) of the Maritime Provinces of Canada. I. New Records from Nova Scotia and Prince Edward Island. The Canadian Entomologist 138:314-332. Cline, A.R. 2006. Commentary on priority of the family-group name Kateretidae Erichson (Cucujoidea). The Coleopterists Bulletin 60:271-272. Medianero, E., G. Castaño-Meneses, A. Tishechkin, Y. Basset, H. Barrios, F. Ødegaard, A.R. Cline, J. Bail, & L. Cizek. 2007. Influence of local illumination and plant composition on the spatial and seasonal distribution of litter-dwelling arthropods in a tropical rainforest. Pedobiologia 51:131-145. Cline, A.R. 2007. A New Species of Thalycra Erichson, 1843 (Coleoptera: Nitidulidae) from Baja California, Mexico with commentary on the genus. The Pan-Pacific Entomologist 83:161-170. Backus, E.A., A.R. Cline, M.S. Serrano, & M.R. Ellerseick. 2007. Lygus hesperus (Hemiptera: Miridae) feeding on cotton: New methods and parameters for analysis of non-sequential electrical penetration graph data. Annals of the Entomological Society of America 100: 296-310. Tishechkin, A.K. & A.R. Cline. 2008. The beetle (Coleoptera) fauna of pocket gopher burrows in Louisiana. Proceedings of the Entomological Society of Washington 110:331-339. Ellis, J.D., K.S. Delaplane, A.R. Cline, & J.V. McHugh. 2008. The association of multiple sap beetle species (Coleoptera: Nitidulidae) with western honeybee (Apis mellifera)colonies in North America. Journal of Apicultural Research 47(3):188-189. Majka, C.G., R. Webster & A.R. Cline. 2008. New Records of Nitidulidae and Kateretidae (Coleoptera) from New Brunswick, Canada. Zookeys 2:337-356. Cline, A.R. 2008. Revision of the Sap Beetle Genus Pocadius Erichson, 1843 (Coleoptera: Nitidulidae: Nitidulinae). Zootaxa 1799:1-120. Audisio P., Kirk-Spriggs A.H., Cline A.R., Trizzino M., Antonini G., Mancini E. & DeBiase A. 2008. A new genus of pollen-beetle from South Africa (Coleoptera: Nitidulidae), with discussion of the generic classification of the subfamily Meligethinae. Insect Systematics and Evolution 39:419-430. Audisio, P., A. De Biase, A.H. Kirk‑Spriggs, A.R. Cline, M. Trizzino, G. Antonini & E. Mancini. 2008. Molecular biogeography of Mediterranean and southern African disjunctions as exemplified by pollen beetles of the Meligethes planiusculus species-group and related taxa (Coleoptera: Nitidulidae; Meligethinae). Biogeographia 29:45-65. Cline, A.R. 2009. A new sap beetle (Nitidulidae: Nitidulinae) genus from the Neotropics, with commentary on the Pocadius generic complex. Zootaxa 2237: 34-42. Audisio, P., Cline, A.R., Lamanna, F., Trizzino, M., Antonini, G., Mancini, E., & DeBiase, A. 2009. Revision of the Southern African Pollen Beetle Genus Anthystrix (Coleoptera: Nitidulidae: Meligethinae). Annals of the Entomological Society of America 102(6):998- 1012. Audisio, P., A.R. Cline, A. De Biase, G. Antonini, E. Mancini, M. Trizzino, L. Costantini, S. Strika, F. Lamanna, & P. Ceretti. 2009. Preliminary re-examination of genus-level taxonomy of the pollen beetle subfamily Meligethinae (Coleoptera: Nitidulidae). Acta Entomologica Musei Nationalis Pragae 49(2):341-504. Lawrence, J.F., S.A. Slipinski, & A.R. Cline. 2010. Corylophidae LeConte, 1852. Pp. 472-481. In Leschen, R.A.B., R.G. Beutel, & J.F. Lawrence (eds.) Handbook of Zoology. Volume IV. Arthropoda: Insecta. Part 38. Coleoptera, Beetles. 786pp. Jelínek, J., C.E. Carlton, A.R. Cline, & R.A.B. Leschen. 2010. Nitidulidae Latrielle, 1802. Pp. 390-407. In Leschen, R.A.B., R.G. Beutel, & J.F. Lawrence (eds.) Handbook of Zoology. Volume IV. Arthropoda: Insecta. Part 38. Coleoptera, Beetles. 786pp. Jelínek, J. & A.R. Cline. Kateretidae Erichson in Agassiz, 1846. Pp. 386-390. In Leschen, R.A.B., R.G. Beutel, & J.F. Lawrence (eds.) Handbook of Zoology. Volume IV. Arthropoda: Insecta. Part 38. Coleoptera, Beetles. 786pp. Cline, A.R. & S.A. Ślipiński. 2010. Discolomatidae Horn, 1878. Pp. 435-442. In Leschen, R.A.B., R.G. Beutel, & J.F. Lawrence (eds.) Handbook of Zoology. Volume IV. Arthropoda: Insecta. Part 38. Coleoptera, Beetles. 786pp. Cline, A.R. & F.W. Shockley. 2010. Biphyllidae LeConte, 1861. Pp. 306-311. In Leschen, R.A.B., R.G. Beutel, & J.F. Lawrence (eds.) Handbook of Zoology. Volume IV. Arthropoda: Insecta. Part 38. Coleoptera, Beetles. 786pp. Cline, A.R., M.A. Goodrich & R.A.B. Leschen. 2010. Byturidae Jacquelin duVal, 1858. Pp. 286- 292. In Leschen, R.A.B., R.G. Beutel, & J.F. Lawrence (eds.) Handbook of Zoology. Volume IV. Arthropoda: Insecta. Part 38. Coleoptera, Beetles. 786pp. Cline, A.R. 2010. Smicripidae Horn 1879. Pp. 407-411. In Leschen, R.A.B., R.G. Beutel, & J.F. Lawrence (eds.) Handbook of Zoology. Volume IV. Arthropoda: Insecta. Part 38. Coleoptera, Beetles. 786pp. Cline, A.R. & J.V. McHugh. 2010. New Generic Synonymy in Biphyllidae (Coleoptera: Cucujoidea), with a Checklist of Anchorius Casey 1900. The Coleopterists Bulletin 64:98-99. Cline, A.R. & P. Audisio. 2010. Revision of the New World Short-Winged Flower Beetles (Coleoptera: Cucujoidea: Kateretidae). Part I. Generic Review and Revision of Anthonaeus Horn, 1879. The Coleopterists Bulletin 64: 173-186. Cline, A.R. & P. Audisio. 2011. Epuraea (Haptoncus) ocularis Fairmaire (Coleotpera: Nitidulidae) recently found in the U.S.A., with comments on Nearctic members of Epuraea Erichson. The Coleopterists Bulletin 65: 24-26. Anderson, R.S. & A.R. Cline. 2011. Magdalis barbicornis (Latrielle) (Coleoptera: Curculionidae: Mesoptilinae) in California, U.S.A. The Coleopterists Bulletin 65: 80-81. Cline, A.R. & J.P. Huether. 2011. Revision of the blister beetle genus Tricrania LeConte, 1860 (Coleoptera: Meloidae: Nemognathinae). Zootaxa 2832: 1-43. Audisio, P., A.R. Cline, E. Mancini, M. Trizzino, S.S. Avgin, & A. DeBiase. 2011. Four new Palaearctic Brassicogethes (Coleoptera, Nitidulidae, Meligethinae), and phylogenetic inference of the B. coracinus group. Rendiconti Lincei: Scienze Fisiche e Naturali. Audisio, P., A.R. Cline, E. Mancini, M. Trizzino, F. Lamana, & G. Antonini. 2011. A new species of southern African pollen beetle and discussion of the taxonomic position of Jelinekigethes Audisio & Cline, 2009 (Coleoptera: Nitidulidae: Meligethinae). Zootaxa 2909: 47-56. Audisio, P., J. Jelinek, A.R. Cline, E. Mancini, M. Trizzino, P. Cerretti, & G. Antonini. 2011. Description and taxonomic position of a new genus and species of southern African pollen beetle (Coleoptera: Nitidulidae: Meligethinae). Zootaxa 2927: 49-56. Avgin, S.S., D. Magri, G. Antonini, E. Mancini, A. Lasoń, A.R. Cline & P. Audisio. 2012. Review of the cedar forest-associated Epuraea latipes species group (Coleoptera: Nitidulidae: Epuraeinae), with description of a new species from southern Turkey. Entomologica Fennica 23:49-62. Cline, A.R. & F.W. Shockley. 2012. A new species of Fallia Sharp (Coleoptera: Discolomatidae) from the West Indies, with a checklist of World Fallia. The Coleopterists Bulletin 66:93-99. Cline, A.R. & S.A. Kinnee. 2012. A new species of sap beetle (Coleotpera: Nitidulidae) from Baja California Sur, Mexico, with a review of the genus Lobiopa Erichson, 1843. Pan-Pacific Entomologist 88:202-211. DeBiase, A., G. Antonini, E. Mancini, M. Trizzino, A. Cline, & P. Audisio. 2012. Discordant patterns in the genetic, ecological, and morphological diversification of a recently radiated phytophagous beetle clade (Coleoptera: Nitidulidae: Meligethinae). Rendiconti Lincei Scienze Fisiche E Naturali 23:207-215. McCoshum, S.W., M.S. Caterino, & A.R. Cline. 2012. Introduction of Sap Beetles (Coleoptera: Nitidulidae) on Santa Catalina Island, California, USA. The Coleopterists Bulletin 66: 347-350. Cline, A.R. & P.E. Skelley. 2013. Discovery of new species and country records for the North American sap beetle fauna (Coleoptera: Nitidulidae). Zootaxa 3683(2)101-116. Cline, A.R., B. Villegas, C.O’Brien, & M. Pitcairn. 2013. The Status of Euhrychiopsis lecontei (Dietz) (Coleoptera: Curculionidae) in California, with Notes on Other Weevils Associated with Milfoil. The Coleopterists Bulletin 67: 75-80. Cline, A.R., P.E. Skelley, & P. Audisio. 2013. Morphology and life history of Brachypeplus glaber LeConte (Coleoptera: Nitidulidae), with a discussion of multiple life stage data for phylogenetic analyses. Zootaxa 3734(2): 259-272. Jenkins, D.A., A.R. Cline, B. Irish, & R. Goenaga. 2013. Attraction of pollinators to atemoya (Magnoliales: Annonaceae) in Puerto Rico: A synergistic approach using multiple nitidulid lures. Journal of Economic Entomology 106: 305-310. Marini, F., F. Muteinelli, F. Montarsi, A.R. Cline, E. Gatti, & P. Audisio. 2013. First report in Italy of the dusky sap beetle, Carpophilus lugubris Murray, a new potential pest for Europe. Journal of Pest Science 86: 157-160. Audisio, P., A.R. Cline, E. Solano, E. Mancini, F. Lamanna, G. Antonini, & M. Trizzino. 2014. A peculiar new genus and species of pollen-beetle (Coleoptera: Nitidulidae) from eastern Africa, with a molecular phylogeny of related Meligethinae. Systematics and Biodiversity 12(1): 77-91. Audisio, P., F. Marini, F. Mutinelli, F. Montarsi, E. Gatti, & A.R. Cline. 2014. A scientific note on rapid host shift of the invasive dusky sap-beetle (Carpophilus lugubris) in Italian beehives: new commensal or potential threat for European apiculture? Apidologie 45: 464-466. Cline, A.R., P.E. Skelley, S.A. Kinnee, S. Rooney-Latham, & P. Audisio. 2014. Multi-trophic interactions between a sap beetle, Sabal palm, scale insect, fungi, and yeast, as well as discovery of a compound with antifungal properties. PLOS-One 9(2): 1-12. Cline, A.R., T. Smith, K. Miller, M. Moulton, M. Whiting, & P. Audisio. 2014. Molecular phylogeny of Nitidulidae: assessment of subfamilial and tribal classifications, and formalization of the family Cybocephalidae (Coleoptera: Cucujoidea). Systematic Entomology 39: 758-772. Navarette-Heredia, J.L., S. Zaragoza-Caballero, A.R. Cline, A. Burgos-Solorio, & M. Vásquez-Bolaños. 2014. Coleópteres Necrócolos. Pp. 71-84. In Guerrero, S., J.L. Navarette-Heredia, and S.H. Contreras Rodriguez (Coordinators) Biodiversidad del Estero El Salado. Primera edícíon, 2014. Universidad de Gaudalajara, Guadalajara, Mexico. ISBN 978-607-7420-93-4. Touroult, J., A. Asenjo, A. Ballerio, P. Batista Dos Santos, O. Boily, S. Boucher, F. Cassola, J. Chassain, A. Cline, R. Constantin, G. Curletti, P. Dalens, N. Degallier, C. Dheurle, T. Erwin, F. Feer, C. Fediuk De Castro-Guedes, C. Flechtemann, D. Gonzales, G.T. Gustafson, A. Herrmann, M. Jameson, P. Leblanc, D. Lohez, A. Mantilleri, L. Massutti De Almeida, M. A. Moron Rios, I. Paulmier, Y. Ponchel, P. Queney, S. Rojkoff, J. Rheinheimer, C.S. Ribeiro, F. Wachtel, J. Yvinec, I. Witte, & S. Brule. 2014. Combien y-a-t-il d'espèces de Coléoptères en Guyane? Une première analyse du référentiel TAXREF. ACOREP-France : Coleopteres de Guyane. Tome VIII. 2014:3-18. Westcott, R.L., S. Bily, A.R. Cline, S.D. Gaimari, H. Hespenheide, T.C. MacRae, M.G. Volkovitsh, S.G. Wellso, & G. Williams. 2014. ‘In Memoriam. Charles Lawrence Bellamy.’ The Coleopterists Bulletin 68: 1-13. Audisio, P., A.R. Cline, M. Trizzino, E. Mancini, G. Antonini, & P. Cerretti. 2015. Revision of the African pollen beetle genera Tarchonanthogethes and Xenostrongylogethes, with insect-host plant relationships and cladistic analysis of the Anthystrix genus-complex (Coleoptera: Nitidulidae: Meligethinae). Zootaxa 3920(1): 101-152. Audisio, P., P. Scaramozzino, S. Sabatelli, E. Mancini, & A.R. Cline. 2015. Carpophilus zeaphilus, a new sap beetle species acclimatized in Italy (Coleoptera: Nitidulidae). Fragmenta Entomologica 47(1): 33-35. Cline, A.R., G. Powell, & P. Audisio. 2015. Beetles (Coleoptera) of Peru: A survey of families. Nitidulidae. Journal of the Kansas Entomological Society 88(2): 217-220. Jenkins, D.A., C. Millan-Hernandez, A.R. Cline, T. McElrath, & R. Goenaga. 2015. Attraction of pollinators to atemoya (Annona squamosa x Annona cherimola) in Puerto Rico using commercial lures and food attractants. Journal of Economic Entomology 1-7(2015); DOI: 10.1093/jee/tov136. Mancini, E., A. DeBiase, A.R. Cline, G. Antonini, M. Trizzino, T. Clayhills, S. Sabatelli, P. Cerretti, & P. Audisio. 2015. Morphological, genetic and host-plant diversification in pollen-beetles of the Brassicogethes coracinus group (Coleoptera: Nitidulidae: Meligethinae). Rendiconti Lincei (23 November 2015): 1-19. Cline, A.R., M.A. Ivie, C.L. Bellamy, & J. Scher. 2008. Wood Boring Beetles of the World: Wood Boring Beetle Families, Lucid v. 3.4. USDA/APHIS/PPQ Center for Plant Health Science and Technology, California Department of Food and Agriculture, and Montana State University. Shockley, F.W. & A.R. Cline. 2009. Discolomatidae Horn 1878. Discolomatid beetles, Discolomid beetles, Mexican hat beetles. In The Tree of Life Web Project. Shockley, F.W., & A.R. Cline. 2011. Biphyllidae LeConte 1861. False skin beetles, Biphyllid beetles. In The Tree of Life Web Project. Powell, G., A.R. Cline, & P. Audisio. 2015. A checklist of the Nitidulidae of Brazil. In Catálogo Taxonômico da Fauna do Brasil. Cline, A.R. 2010. Coleopterists Society financial statement for 2009. The Coleopterists Bulletin 64: 400. Cline, A.R. 2009. Coleopterists Society financial statement for 2008. The Coleopterists Bulletin 63: 522. Cline, A.R. & C.L. Bellamy. 2005. Coleoptera. pp. 3-6 In S.D. Gaimari (ed. ), California Plant Pest and Disease Report. CDFA, Sacramento, CA. 76pp. Cline, A.R. 2001. Differential diversity of frugivorous beetles in primary and secondary forests in LaSelva, Costa Rica. OTS Topical Biology an Ecological Approach. 01-03:199-203. Cline, A.R. 2001. Nested quadrat design for estimating species accumulation curves of litter dwelling Coleoptera. OTS Topical Biology an Ecological Approach. 01-03:239-245. Cline, A.R. 2001. Differential diversity of leaf litter Coleoptera in tree fall gaps and secondary forests. OTS Topical Biology an Ecological Approach. 01-03:33-37. Cline, A.R., B.P. Freymann, M. Donnelly, J.Y. Adkins, J.F. Bischoff, J. Koslow, and K.R.T. Whelan. 2001. A structured inventory of the amphibian population at Palo Verde, Costa Rica and the corresponding vegetation. OTS Topical Biology an Ecological Approach. 01-03: 370-396. Cline, A.R. & K.R.T. Whelan. 2001. Freshwater shrimp populations in a stream at the Reserva Absoluta Cabo Blanco, Costa Rica. OTS Topical Biology an Ecological Approach. 01-03:331-338. Cline, A.R. & K.R.T. Whelan. 2001. Building the better beetle trap: constructing a leaf litter sifter and large scale Berlese extraction funnel. OTS Topical Biology an Ecological Approach. 01-03:79-82. Kutner, M., J. Adkins, C. Nufio, S. Busch, A.R. Cline, D. Farmer, & R. Rowe. 2001. Terrestrial arthropod diversity and soil comparison of the Pacific and Atlantic slopes in the Cerro de la Muerte region, Costa Rica. OTS Topical Biology an Ecological Approach. 01-03:59-64. Valejo, M., A.R. Cline, K. Barton, J. Bischoff, & A. Sweiggert. 2001. Are you in or are you out? Predation on fruits and seeds of Heliconia tortuosa. OTS Topical Biology an Ecological Approach. 01-03:21-24. Wilkinson, E., R. Yukilevich, T. Brown, A.R. Cline, S. Solomon, & M. Valejo. 2001. Foraging behavior in the Neotropical army ant Eciton burchelli. OTS Topical Biology an Ecological Approach. 01-03:122-129. Yukilevich, R., J. Koslow, E. Lindquist, P. Sherman, A.R. Cline, M. Bateman, K. Barton, & S. Solomon. 2001. Foraging preference and forest impact of the crab Gecarcinus quadratus in the Cabo Blanco Biological Reserve, Costa Rica. OTS Topical Biology an Ecological Approach. 01-03:266-270. Cline, A.R. 2000. “Millenium Edition – Tiger Beetle”. 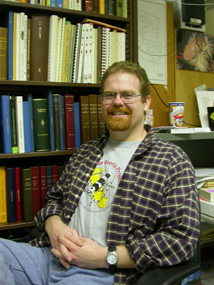 An semi-annual report for the Department of Entomology at the University of Missouri. Cline, A.R. 1999. General Entomology Lab Exercises (X3), University of Missouri. Cline, A.R. 1997. Organismal Biology Laboratory Manual, Univ. of Alabama - Huntsville. 74pp.